Last night I went to see the Hairy Bikers at the Sands Centre in Carlisle. It was an excellent night out, not a huge amount of cooking, but lots of stories with early photos and clips from some of the programmes. I laughed till I cried at some of their antics, don't go if you are easily offended! 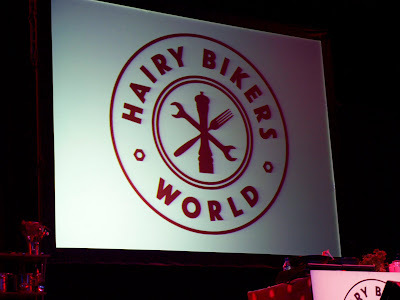 Sadly they announced that photographs were not allowed, I had already taken a couple of the stage before the announcement, but didn't risk it once the bikers were on stage. They made South Indian King Prawns in Coconut with Kerala Parathas in the first half, then Tuscan Beef Supper and Lemon & Courgette Linguine in the second half. All the recipes and more were included in the Tour Programme (first photo). 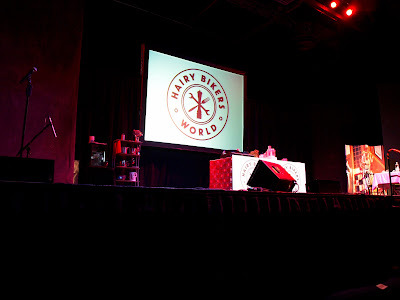 Two lucky couples were invited onto the stage to eat these dishes, but sadly we were not chosen. What was really interesting was how mixed the audience was, there were all ages and lots of men as well as women. I think this reflects the universal appeal of the Hairy Bikers and their down to earth outlook on life. Sounds like a fantastic night out Janice - lack of photos notwithstanding. 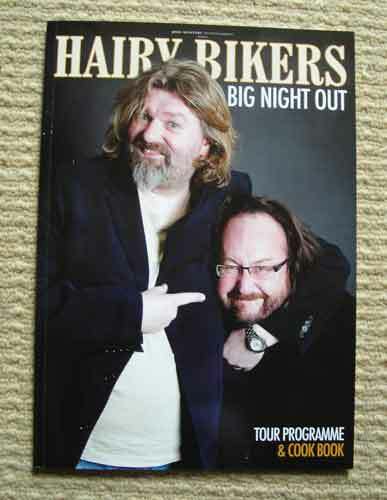 I love the Hairy Bikers :D glad you had a good night! I bet that was a memorable night out Janice. They are funny, and the plus is, they cook some good food too!